Japanese sportswear brand, Zerofit, entered the European market towards the end of 2018, with their warm base layer ranges leading the way. The base layer is often overlooked when it comes to piecing together the perfect winter golf outfit, but it really shouldn’t be. We’ve been trying out a couple of their latest products to see if they really do provide that much needed warmth without affecting performance. We have been lucky enough to get our hands on the HEATRUB ULTIMATE and the HEATRUB MOVE base layers. Golf journalist Joe Hughes and Golfshake's Kevin Paver have shared their thoughts on the products. Beginning with the ULTIMATE, this seems to really be the show piece of the collection, particularly when it comes to golf. The thick, soft feel of the item makes it pleasant to wear and is really comfortable against the skin. The HEATRUB technology is said to begin warming your body up as soon as you put the item on. They have clearly done a lot of testing around this and I would agree with them as I did feel the difference pretty much immediately. The garment is designed in such a way that it can be used as either a base layer underneath further pieces of clothing, or as a standalone top. The mock neck collar design is flawless really when it comes to keeping out the draft and ensuring that your body is well insulated. The fit of the body and neck were good; however, I found the sleeves to be short. The MOVE has a slightly thinner make up but was not really any less warm. The HEATRUB technology that also features in this garment works just as well and adds to the feeling that you are wearing a luxury base layer. The looks and feel of the MOVE are more traditional and are similar to those produced by other brands, but I wouldn’t say this is a negative aspect as the performance was great. Again, I would say that the main flaw in this product is the length of the sleeves. I’m aware that you won’t be able to cater for everybody’s arm length, but I felt that the MOVE as well as the ULTIMATE would only really fit those with shorter arms. I thought the HEATRUB MOVE was a great base layer. Throughout testing in some pretty cold conditions, it kept me super warm, and seemed to do a good job of removing moisture too. However, what I really liked was that it but didn’t feel quite as restrictive as some base layers can be. Still had plenty of movement to swing the club, even with two layers on top of it, although I did feel that the mock neck was a little too loose for me. Maybe after a few more pies at the half way house it would be perfect! All in all, a thoroughly good base layer. The HEATRUB ULTIMATE is a very different kind of baselayer. Imagine playing golf whilst wrapping yourself in your favourite fake fur rug and you’ll be somewhere near! Ok, maybe it’s not quite as extreme as that, but the ‘Ultimate Baselayer’ is very thick, with an almost fur lining. Despite the thickness of the base layer, it still provides plenty of movement whilst you play golf, but it provides you with immense warmth. The ‘Frictional Heat Generation’ that Zerofit have developed was definitely noticeable in the -1 degrees I tested this product in. 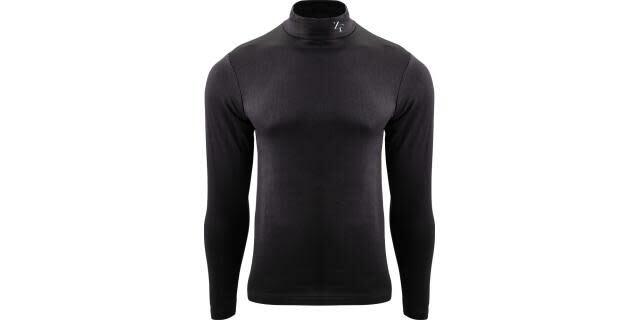 A quality base layer for winter golf here in the UK.